Anyone who has been involved in Sussex football for the past 60 years will recognise the name Mick Fogden. The 78-year-old began his senior football career at Shoreham Boys Club in the 1956-57 season and has been involved in football in the county ever since. He has spent time with Hove Town, Shoreham, Brighton & Hove Albion, Southwick, Whitehawk, Lewes, Burgess Hill, Lancing, Wealden (now AFC Uckfield) and Worthing, where he has been coaching for the best part of the past ten years. Fogden says he has just been very lucky to be involved in the sport he loves for so long and has several fond memories. He has had title-winning seasons, promotions and relegations along the way and also coached the most talented youngsters at Brighton for 15 years. He made his debut as a 16-year-old in a 4-3 win for Shoreham Boys Club at East Grinstead in the 1956-57 season. 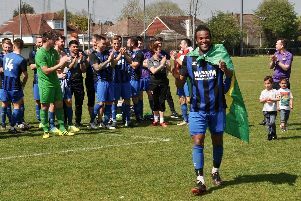 Spells followed at Hove Town, Shoreham and Southwick before he joined Whitehawk, but a back injury forced him to retire in his mid-20s. Soon afterwards was when his coaching career began. Fogden said: “I was very lucky because John Shepherd, who was manager of Southwick at the time, asked me to coach the reserves. We won the West Sussex League in the first year and got to the Sussex Intermediate Cup semi-finals. “I then ran the Sussex reserve section side and we won the league for three years on the trot. From there, I went back to Southwick with Brian Powney, where we won the league and went to Bournemouth in the first round proper of the FA Cup in 1973. “John Shepherd then got the youth job at Brighton and he asked me to go with him. People don’t realise that we started then the school of excellence, which is now at Lancing. “They had nothing at all then at Brighton. We were part-time and had trials most Sundays – Ian Wright came once and we let him go. “We got to the Youth Cup final and I think it’s the only time the under-18s at Brighton have won anything. “We beat West Ham in a two-legged final, we drew 2-2 at Upton Park and beat them 2-1 at the Goldstone, which was a real highlight for me. “Chris Cattlin put us on at half-time in the next game and the lads walked around with the cup, which was brilliant for them in front of a big crowd. Recalling the Wright story, Fogden, who received an award from the Sussex FA for 50 years’ service to football in 2014, said: “In those days, we used to get a load of letters. Fogden has also seen many changes in the game and said: “In the old days, we used to have an old leather ball with laces in. If it had been wet, the ball would be coming at you and you’d see the spray coming off it and you’re about to head it. “Half of the players nowadays would duck out the way because they’re not as strong and physical but, saying that, they’re not allowed to be. “I used to tackle and was a good tackler. Some of the old boys now wouldn’t have lasted five minutes in today’s game. They weren’t dirty, it’s just they went in hard. You can’t touch a person now, a little push and it’s a free kick. “Football has changed from that point of view but also up to the coaching. We now have videos to go through things in training. “We didn’t even have televisions in my day when I was playing, so it’s all hi-tech now and for the better. I think video replays are great. You can stop it and tell someone ‘why weren’t you there?’. It’s something players learn from. Fogden, who is still working ten hours a week for the NHS, got his coaching badges when working under Alan Mullery at Albion. He has coached for a number of managers throughout Sussex and said: “I’ve seen a few managers come and go. “The managers that stick out for me are John Shepherd, he was brilliant, Brian Powney was great and Alan Pook called a spade a spade and you’ve got to respect that. “Chris White was a very good manager and I think he’s given it all up prematurely. I tried to talk him into staying at Worthing and it’s such a waste he’s no longer involved. “Adam Hinshelwood, you can tell, is going to be a top, top manager. “Jon Meeney has now left Worthing and I wish him all the best as he’s a top coach. But I learned a lot from him, Gary Elphick and Matt Piper. I’ve been in the game for 60 years and I’m still learning. “There’s different ways of training and it’s different to my day. It wasn’t bad back then but they’ve taken it to a different level now, with all this high-tech stuff. “I hope to stay with Worthing, I don’t want to give up yet. I get on well with them but I don’t interfere. Why has he stayed in the game so long? “I love it. In the summer, I sit at home and lose money on the horses. “I just like the buzz of being involved and I still get that buzz now, if I miss a game I’m looking out for what the score is and I look forward to every game. Once that goes, that will be me done. “It’s what keeps you going, something to look forward to. “It’s great to have the memories too. Jimmy Melia took us out to the middle of Wembley before the FA Cup final, there’s not many people who can see they’ve been on the pitch there before a cup final. And Southwick going to Bournemouth in the FA Cup was a good day, there’s not many County League sides that get that far. “I’m just chuffed to have been in the right place at the right time. “And I’m at a good club now and I think Worthing are going to get a lot better. I just wish I was a lot younger so I could go on the journey with them.